I thought some reminders would be helpful! Dress comfortable! It’s gonna be warm so you don’t want to sweat to death! I am SOOO excited for this!! SO! Excited!! 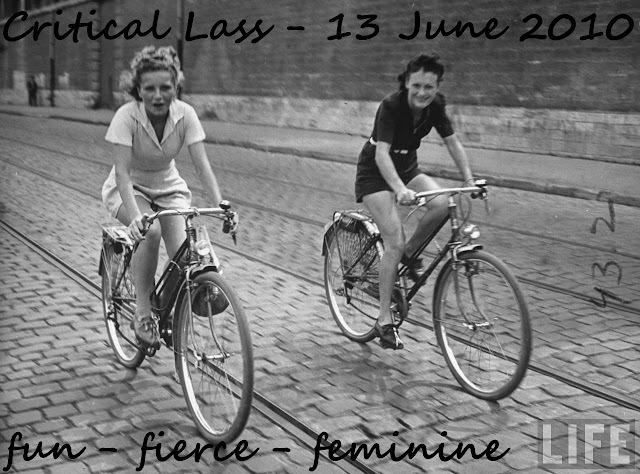 Critical Lass – OFFICIAL ANNOUNCEMENT! Welcome to the Official blog post for Critical Lass Spring 2010! Are you Ladies (& Gents? Do we have Gents around?) excited? I certainly am! Route to include: End of Rail Park, Ritchie Community League Rink to cheer on the Polo Velo players, Saskatchewan Drive, University – Belgravia area, Cupcakes! We realize not everyone will be able to stay on the route for the entire duration of the ride, so feel free to join and leave as needed. Unfortunately being a Sunday many places are closed (Whimsical, Transcend & redbike) BUT we can still window shop! And there are a few places within the immediate area that are open, so while limited, we do have options for refreshments! For more information: The discussion post on Critical Lass has TONNES of other suggestions and ideas. For contact info (if you might be late, wanting to meet up with us at a later point, etc) send a DM to myself (@angelzilla) or Deborah (@ecoDomestica) on twitter, or leave a way in which we can send cell numbers so we can all coordinate! Update: we have buttons for participants, made by @mspixieriot – Thanks Eri! Thanks also to the fabulous Miss Sarah for providing the photo from her blog for adaptation! That’s her fabulous heel on the pedal of her fabulous Pashley in the photo. The LFL ladies first started talking among ourselves about having a slow ride or style ride back in mid-January. We thought that rather than posting the event as a fait-accompli, it might be helpful both to us and to others organizing similar rides for us to talk about the nitty-gritty of the planning (below and in comments) – but first let us talk about the rationale. We love the idea of bicycle fashion as advocacy, and we thought a ride in fashionable clothes would be a neat way to promote cycling as an approachable, fun, everyday activity. Since June is Bike Month in Edmonton and the weather will be pleasant enough to wear pretty clothes without needing extra layers, it seemed like the best time to do it for the first time. Of course, a style ride is also about dressing up at least a little – but we mean ‘dressing up’ in the dateworthy-outfit sense, not the costume sense. Our aim is girly fun and everyday fashion – although dapper dans are also welcome to come along. Skirts and dresses and adorable capri pants are suggested; so are bike baskets and helmets decorated with flowers and ribbons and pretty stickers. Please wear a helmet, but leave the spandex at home (not that we have anything against spandex, but it’s not how we roll.). If you need some ideas, check out Riding Pretty’s recent post about fashion for summertime tweed rides and the Flikr Bike Wardrobe ReMix Pool for inspiration, then translate to your day-to-day wardrobe. For more about the Slow Ride Movement, see this awesomely slow blog, and this series of posts on Riding Pretty. We think we’d like Critical Lass to be a new quarterly style ride, with the theme being the seasons – and we kind of hope that some of the people we meet through it will be interested in forming an informal social bicycle riding club (that is, a semi-regular thing more like the San Diego 3-Speed Rambling Society or the Petaluma Slow Ride or Chicago’s Slow Ride Society‘s rides). – Liability: Alexa and Victoria pointed out that the possibility of being sued has kept EBC from widely promoting some of their events in the past. EBC are looking into insurance for future events through an agency that provides that service for not-for-profit organizations, but for now they strongly advised that we keep it small and informal. That’s fine with us since it will also help with the social, community-building aspects of the ride. – Promotion will therefore be essentially word-of-mouth, through our blogs and twitter. – The Route: on level roads and paths without much traffic (to make it easy for new cyclists, and allow us to chat while we ride), starting at a convenient central gathering place – in our case, EBC’s Bikeworks, where someone will give us some tips on riding as a group, and how this is different from a faster ride on main streets like Critical Mass, before we go. This location also allows people to meet for brunch nearby beforehand if they wish. Sarah also pointed out that too many stops or too long a route can be discouraging, so we’re going to keep it to a couple of hours. We also need to make sure bicycle parking won’t be ridiculously difficult at our chosen stops. Right now we’re thinking Bikeworks to End-of-Rail-Park for photos, then in leisurely fashion through the residential area around the University, and ending at a little shopping area near the University that includes a LBS and several cafes. We’d like to have a loose schedule and route map so participants know in advance what the route is and where we’ll be (or almost be) at any given time. Let’s chat in the comments about the exact route to take and any other advice and ideas you might have. We’re looking forward to this conversation!